You need steady hands, tones of patience and a sense of colours. The patterns you see on the eggs are teached from mother to daughter since ages. And there still are women who keep up the good work. Pottery is one of the main income sources in Bucovina. 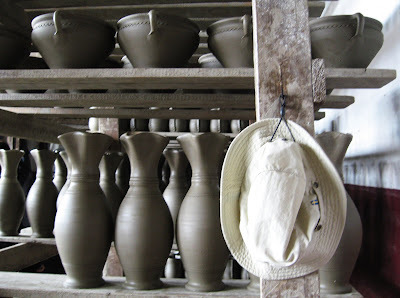 Here are some pictures i did in a pottery workshop in Marginea, a small town/village. There are a thousand things to see in the north-eastern area of Romania. Bucovina is mostly famous for its old, beautiful, greatly painted churches, such as Voronet, Putna, Sucevita, Moldovita etc. Then, there are the old, traditional proffesions: pottery, woodcarvin, eggs panting. These are activities that happen indoors, but Bucovina is also known for horse breeding. Check out this site, of a local minority that calls itself "hutuli": http://www.hutuli.com/english/ The site is not ready yet, still there are some information and photos to see. The landscape is also amazing. There are some relief forms that are only present here, people call them "obcina" and they look like something between mountains and hills. The "obcinas" are covered with old, deep forests. So, here are some photos i took in this trip.